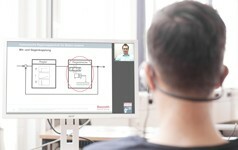 Bosch Rexroth has a unique technological knowledge. This expertise will be passed on to trainees and students, as well as to customers and employees. 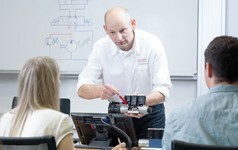 In the Drive & Control Academy, we support customized and practice-oriented education, media , training and training systems in the fields of hydraulics, pneumatics, mechatronics and automation as well as the certification of technical experts using the most modern education methods, also in view of Industry 4.0. Employees‘ specialist knowledge and expertise create a crucial advantage in a competitive global market. Under the umbrella of the Drive & Control Academy, Rexroth provides a consistent, practically focused range of knowledge products in the area of drive and control technology. The Academy sets standards in educationally preparation of specialized and integrated know-how for customers, employees and external training and development institutions. 3. Modern teaching forms and media. The Drive & Control Academy concept is based on our four pillars of knowledge transfer: Training, Training systems, Media and the Knowledge Portal.